It’s that time of the year again. The days are beginning to get that autumnal feel about them and we are also starting to hear about the arrivals of our wintering wildfowl. Having started out on their journeys south, summer visitors are now all but gone, leaving our wetland areas to fill with, amongst others, Pink-footed, Light-bellied Brent and Barnacle Geese from the north. During early September, small numbers of Pink-footed Geese started to arrive on our shores and early reports of birds arriving at WWT Martin Mere on 5 September were followed by reports in Norfolk, with Craig Shaw seeing Pinkfeet arriving on the north Norfolk coast on 22 September. The Monitoring Team received a lovely e-mail from Halldór Stefansson in Iceland reporting that during the early morning of 24 September, a beautiful morning in Iceland, thousands of Pink-footed Geese were flying high heading out to sea and UK bound! Hours later staff at Montrose Basin (northeast Scotland) reported large arrivals, with 22,000 counted on 28 September, and WWT Martin Mere reporting 15,000 at roost on the 29th. 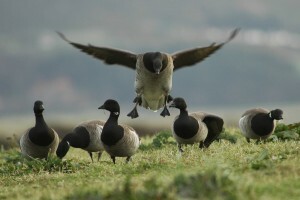 Canadian Light-bellied Brent Geese arrived at WWT Castle Espie like clockwork on the first weekend of September and Andrew Craggs reported Svalbard Barnacle Geese passing over Lindisfarne, Northumberland, on 24 September, with the first arrivals on the Solway at WWT Caerlaverock the next day. Thanks to tracking devices fitted to Greenland White-fronted Geese and Bewick’s Swans, as part of WWT’s research, we can see that the first birds of these species are also now on the move. As the temperature starts to drop in Greenland and Russia the first Greenland Whitefronts have arrived at staging grounds in Iceland and the Bewick’s Swans are starting to head for the Baltic – a sure sign that winter is on the way!